During your pregnancy, you want to have complete confidence and trust in your obstetrician. 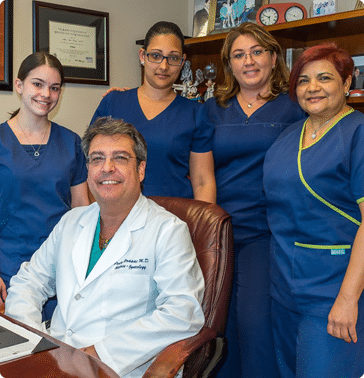 Since 1968, generations of women throughout Miami-Dade County and beyond have turned to the obstetricians at Doral Beach OB/GYN to welcome their baby into the world. Our compassionate and comprehensive obstetrical care is centered on the guidelines set by the American College of Obstetricians & Gynecologists. We provide complete prenatal testing, monitoring, and labor management with one goal in mind: to ensure the healthiest outcome possible for both you and your baby. Please note that we do not provide care for high-risk pregnancies or perform vaginal births after C-section (VBAC). We do, however, perform some of your Pregnancy Ultrasound and blood draws in our office. Our doctors deliver babies at Mount Sinai Medical Center. If you are considering becoming pregnant, visit one of our Miami-area obstetricians for a pre-pregnancy check-up. Otherwise, contact us as soon as you suspect you are pregnant. Prompt prenatal care will help ensure a healthy pregnancy for both you and your baby. Receiving prenatal care can help detect and treat problems early on, prevent complications, and allow us to refer you to a specialist if necessary. Each member of our friendly staff looks forward to welcoming your new baby into the world. Call our offices in Doral at (305) 477-7475 or Miami Beach at (305) 532-1989 to make your appointment with one of our trusted obstetricians today, or you can use our online form to request an appointment.